Tough times is what some people might use to blame the low sales of mobile phones during the first three months of this year. Figures released by the research firm Telegeography reports a 3 percent growth in mobile phone sales during Q1. All together, $251 billion was generated from all the phone sales worldwide – still an increase from the same period last year, but not one that is surprising. There was a huge increase found in emerging markets like India and China; which accounted for 48 percent of the global growth. Over in North America, the U.S. and Canada had minimal growth at 2 percent. Luckily, the U.S. added an additional 1 million broadband subscribers. Some argue that the market is already heavily saturated which makes it extremely difficult. 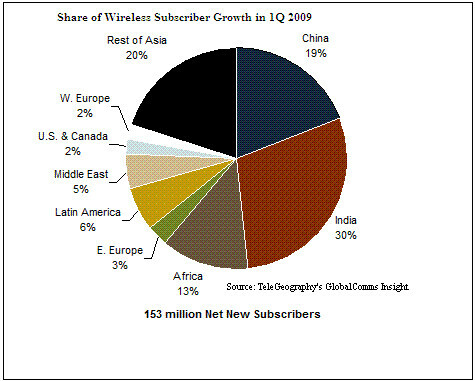 Wireless broadband may be the next source of revenue with 14 million subscribers added during the first quarter. As more manufacturers release data intensive devices and if carriers market properly in emerging markets, there could be some extreme positive results next time. 153 Million Net Subscribers is stagnant? Dang, there's a lot of cell phone users worldwide then, eh? Incorrect. U.S. and Canadian growth was only 2%. That chart does not depict the ratio of cell phone subscribers. It is the expansion of customers in those markets.